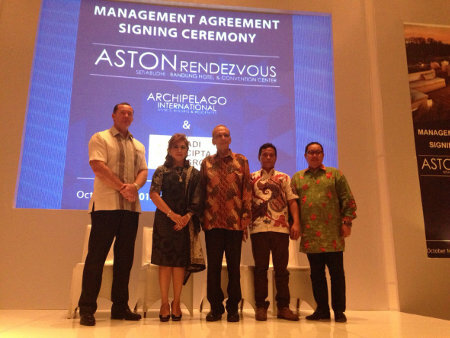 Jakarta, October 26th 2015 - With Bandung becoming increasingly popular among local tourists as a lifestyle destination, Archipelago International, Indonesia's fastest growing hotel management group, recently announced the signing of a new property, Aston Rendezvous Setiabudi, Bandung with PT. Adi Cipta Group. Set to open in the third quarter of 2017, the hotel will be the 4th Aston Hotel in Bandung. Situated on Jalan Setiabudi, the hotel is just 30 minutes from the Husein Sastranegara Airport. It enjoys an address close to popular tourist destinations like the famous Floating Market and Tangkuban Perahu Volcano, one of the most famous attractions near Bandung. This 4 star hotel will feature 300 guest rooms and suites stylishly designed in the contemporary Aston way. As part of the MICE facilities, its modern conference center will boast several auxiliary meeting rooms and a ballroom that can be segregated for more intimate meetings or opened up for larger MICE events and other social gatherings. The hotel will also feature a cozy all-day dining restaurant for casual meetings or a relaxed meal, together with recreational facilities for downtime including a swimming pool, gym and spa for guests' convenience. As an additional benefit for the hotel's guests, PT. Adi Cipta Group teamed up with Bandung city's administration to build a Sky Bridge Cable Car to help alleviate the congestion of traffic in Bandung. The construction of the cable car, set to link several major streets in Bandung with a station at the hotel, will offer direct access to Jalan Siliwangi, Jalan Pasteur and Jalan Setiabudi, providing guests with both ease and convenience when visiting these popular leisure destinations. The cable is scheduled to break ground in December this year with Austrian technology-provider, Doppelmayr - a company that has installed 14,000 units in more than 80 countries. "Bandung is an increasingly metropolitan city and we see our new hotel as a perfectly positioned choice for the influx of both business and leisure travelers. We hope that Aston Rendevouz Setiabudi – Bandung will provide a host of exceptional experiences for our guests and cater to those looking for the very best accommodation and facilities." Said John Flood, President & CEO of Archipelago International.